In spite of successive political turbulence and natural disasters, San Fernando City has emerged as a resilient and growing regional capital. Possibly giving cause to some confusion, San Fernando is one of seven local government units in the Philippines going under this name. The other San Fernando city is in the La Union province of Ilocos Region, on the North-westerly tip of the country in the Luzon island group. The San Fernando city led by Mayor Rodriguez can be found in Pampanga, also on Luzon. Pampanga has historically been one of the richest provinces in the Philippines, sitting on the north shore of Manila Bay. Local government in the Philippines has received increased autonomy in recent years, having previously languished as an adjunct of the centralised state, particularly during the dictatorship era of Ferdinand Marcos. Today there are 17 regions covering the 7,107 islands in the country, which are then divided into 79 historic provinces. These are then broken down into 115 city areas and 1,496 municipalities, with a further 41,392 sub-municipal units known as barangays beneath this. There is no government at the regional tier, except in two autonomous regions with Muslim majority populations. San Fernando’s mayor, Oscar Rodriguez, can rightly point to both a successful career in politics before assuming mayoral office and having played a key role in transforming San Fernando from a town to a recognised city. The campaign for cityhood commenced in 1997, two years after the volcanic eruption of Mt. Pinatubo nearby and the subsequent Typhoon Mameng. 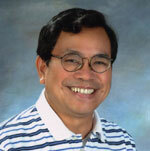 Led by the town’s mayor Dr Rey B. Aquino, the campaign achieved its goal in 2000 when Rodriguez, then the area’s Congressman, gained legislative backing for his proposal to give the town a city charter. After graduating from high school in 1963, Rodriguez began his career in law as a stenographer before graduating from Pampanga’s Harvardian Colleges in 1969 and with a lawyer’s degree from Far Eastern University in 1973. Called to the country’s bar a year later, a series of legal posts followed, including professorial roles in local law schools. After serving one year as Pampanga’s Provincial Administrator, he was then elected in 1987 to the first Congress to be constituted following the resumption of democracy after the Marcos regime was overthrown in 1986. Having lost his seat, he returned to law, teaching as a professor of contract law and acting as a human rights lawyer. In 1995 he was returned to the House of Representatives, where he sat until 2004. During this time he drafted key legislation and constitutional amendments and served on a number of UN bodies. He is a member of the country’s governing party, LAKAS (the Christian and Muslim Democrats). Prior to becoming mayor, Rodriguez sought the Pampanga governorship but lost out to a party colleague. As mayor, he may be seen to bring the benefit and influence in government that Congressional office carries but Rodriguez has also spelt out his vision for the city’s growth, particularly as the driver of the regional economy in Pampanga. In addition to this and his priorities in education and welfare of citizens as being integral to a strong local economy, Mayor Rodriguez has stipulated an eight-point plan to promote the city as a centre of foreign investment in banking, tourism and culture. Most citizens appear to be content with his balancing the budget at city hall, waste management programme and managing the worst excesses of recent natural disasters however. 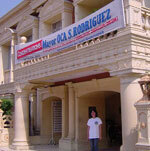 What now comprises the City of San Fernando (Pampanga, Philippines) was carved out of the towns of Mexico and Bacolor. San Fernando became a pueblo, or town, in 1754, during the reign of Fernando VI, king of Spain. Though legend has it that the town was named after its founder, a certain Capitan Fernando, it was most probably named San Fernando in honour of the king. As such, its titular patron is San Fernando III, King of Castille and Leon, which is now part of modern day Spain. San Fernando is considered to be the birthplace of the labour movement in the Philippines. The first organised strike was said to have taken place in 1872 by printers at a government press located in the town, in protest against abuses by the plant foreman. The first labour union was also established in San Fernando in the printing plant of La Independencia, edited by General Antonio Luna. It was known as the Union de Lithografos y Impresores de Filipinas (ULIF), organised and headed by Hermenegildo Cruz. The socialist movement would later find its roots in the town during the early part of the twentieth century under the leadership of Pedro Abad Santos. On 23 February 1892, the San Fernando train station was opened as part of the Bagbag-Mabalacat stretch of the Manila-Dagupan railway system. This event signalled the beginning of the exponential growth of the town brought about by the sugar boom in the province of Pampnaga. On June 27 of the same year, national hero Dr. Jose P. Rizal visited the town as part of his mission to recruit members into his La Liga Filipina. After the outbreak of the Philippine Revolution, the town was declared to be in a state of war on 1 September 1896. Antonio Consunji was presidente municipal under the Republika Filipina, 1898-1899. On October 9, 1898, President Emilio F. Aguinaldo and his cabinet visited the town. The Red Cross established a hospital for wounded revolutionaries on February 10, 1899. Some accounts say that the town became a temporary seat of the Philippine Revolutionary Government from 1 April to 4 May 4 1899, when on the orders of General Antonio Luna, the Philippine Revolutionary army burned the poblacion, including the church and casa municipal. Vivencio B. Cuyugan was its first mayor under the Philippine Commonwealth. In 1941 the Japanese Imperial Army occupied the town, and because of its strategic location it was used as their base of operations in their assault on Bataan. In 1942 it also served as the transit point for the Bataan Death March. Filipino and American prisoners-of-war, after the long walk from Bataan, were transported from the San Fernando Train Station to Capas, Tarlac. In 1995 floods and mudflows from Mount Pinatubo heavily damaged San Fernando. It became the 99th city of the Republic of the Philippines by virtue of the ratification of Republic Act 8990 on 4 February 2001. The City of San Fernando, Pampanga, home of the world-renowned giant lanterns, is one of only two cities in the Province of Pampanga, and serves as the provincial capital and regional seat of government of Central Luzon (Region III). Located 67 kilometres north of Manila, 16 kilometres south of the Clark Special Economic Zone, and 50 kilometres east of Subic Bay, San Fernando is strategically positioned at the crossroads of Central Luzon, so that travellers and commuters coming and going to Clark, Subic, Metro Manila, Cabanatuan City and Baguio City traverse it. Bounded by the municipalities of Bacolor on the southwest, Mexico on the northeast and Sto.Tomas on the southeast, and by Angeles City on the northwest, the City of San Fernando is composed of 35 barangays with a land area of 6,774 hectares, with a population of 221,857.